Sherry's hybrid Disk or the Storm Disk is Sherry LeBlanc's Duel Disk in the Yu-Gi-Oh! 5D's anime. It is similar in design to Crow Hogan's, only with inverted colors and the board being straight with circular edges. 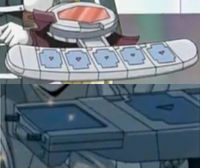 When attached to her Duel Disk, the Sturm und Drang, the Duel Disk's base is attached below the dashboard with the blade swerving around to face the long neck of the Duel Runner and connect to it vertically. When inactive in ground mode, it folds into three corners around the Duel Disk's base. The Field Spell Card Zone has an attachment that functions like a police tazer after it pops out. This page was last edited on 4 February 2016, at 05:47.